In September 2002, Maria Ressa, CNN’s Southeast Asia bureau chief, viewed more than 250 videotapes which experts believe were recovered from Osama bin Laden’s private collection in Afghanistan. More graphic images followed, including a man whose arm was being amputated as the camera panned to the tattered flesh on his back. 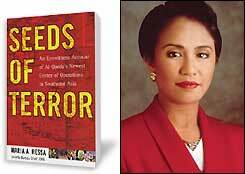 AUTHOR: Maria Ressa, CNN Southeast Asia bureau chief, explores the roots of terrorism in her new book. Of note, the driving force behind terrorists, psychiatry, is peculiarly anti-religious, holding that man is a stimulus-response animal, not a spiritual being. The majority of psychiatrists are atheistic or agnostic, according to a published study,25 while in the medical field, psychiatrists are the most likely of all doctors to commit suicide. Particularly since the Second World War, psychiatry has insinuated its way into military and political affairs. Traditionally, a psychiatric stock-in-tradefrom Nazi “racial hygiene” to Bosnian Serb “ethnic cleansing"has been to devise political or military means of aiding totalitarian efforts. When human rights violations are involved, history has judged such methods to be criminal. In the case of terrorism, such violations are massive, calculated to create as much physical harm and mental distress as possible. Thus, psycho-terrorism and related violent acts are more properly and accurately understood when viewed from a military, political or even organized crime perspective. Those who commit acts of terror or who lead others to commit them do not and never have represented Islam, Ahmed said. “As soon as you kill innocent people for your own cause, you’re doing it for a political agenda, a personal agenda, and not for any religious reason,” she added. Freedom’s research revealed that psychiatric methodsbuilt as they are upon the concept that man is an animaldeftly steer members of the Islamic faith away from their religion’s ideals and values. Other examples include “Let there be no compulsion in religion” (Sura 2:256) and “Deal gently with disbelievers....” (Sura 86:17). One program, “death education,” for example, places such an emphasis on death that some children begin to seek it26an action, of course, at odds with Islam, Christianity, Judaism and virtually every other religion. 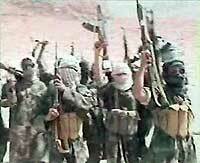 These programs create fertile ground from which terrorist networks gather recruits. As described in “ ’Sacred’ Explosions” (Volume 35, Issue 1), added inducement comes from substantial monetary rewards for suicide bombers and their families. Family members have their debts liquidated, plus relatives receive pensions for life said to be a minimum of twice the income received before the bomber died. Funding for this reportedly comes from Iran, laundered via the Central Bank of Syria in Damascus and the Central Bank of Greece in Athens, and is then transferred to a Cairo account, from whence it gets couriered to Gaza City. Israeli intelligence believes money also may be transferred from Tehran to Cairo and to Yemen. Television presents images of “militants” chanting, and of suicide bombers in green headdresses reciting the Quran, he noted, but these and similar displays of propaganda are simply not enough to create the sweeping behavioral changes needed to produce a suicide bomber. Herein lies the role played by the doctors of terrora role that warrants scrutiny by anyone interested in bringing peace to the Middle East and the rest of the world. “The aggressors can commit such violence only with the intention of attacking religion itself,” said Harun Yahya, author of Islam Denounces Terrorism. 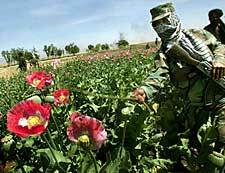 In a stark subversion of Islamic principles, terrorists have cashed in on drug-trade profits estimated at up to billions a year from one nation alone (Afghanistan)both to support their operations and to sedate or stimulate their suicide operatives. AFGHAN POLICE OFFICERS guard a poppy field about to be destroyed; such crops reportedly continue to serve as gold mines for terrorists. IRAQ: The Jordan Times reported on March 24, 2004, that as many as 200 terror cells flourish in Iraq, with cash from drug sales bankrolling them and pills provided to suicide bombers for their deadly missions. “The drug merchants are closely related to al-Qaeda people,” explained Karbala police chief, Colonel Karim Sultan. THAILAND: “At this stage, we believe that these people were hired by ill-meaning masterminds paying them with drugs and other things,” said Thai Army chief, General Chaisit Shinawatra. He referred to youths who stormed police stations in three southern Thailand provinces, claiming the lives of 107 attackers, three policemen and two soldiers in April 2004. The Thai public health minister, Sudarat Keyuraphan, confirmed that methamphetamines and other illegal drugs were found in the blood of some of the insurgents. * A sure is a chapter in the Quran. Linda Amato and Anne Hogarth contributed to this article. © 2003-2006 Church of Scientology International. All Rights Reserved. For Trademark Information on Scientology Services.